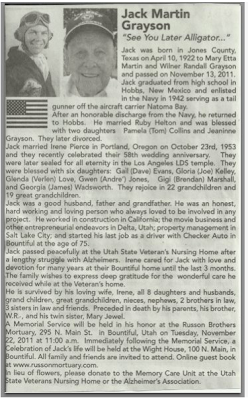 Today we celebrated our Papa Jack's life. He was a kind, funny, hardworking and simply a wonderful grandpa. I think Steph and I got a little bit of our love for creating things from him. We love you Papa Jack! This is a wonderful time of year to celebrate our ancestor's lives. My father died on November 13th, 2 years ago. My thoughts will be with your family this weekend. Dearest Sharon, thank you for your sweet note! You are also in my thoughts right now! Take care my good friend!